By the time you have the liberty to read this blog, you might not remember why you did. But I seriously hope you do. Because of all the evenings in the past 9 years of co-sleeping with you, tonight was the hardest. 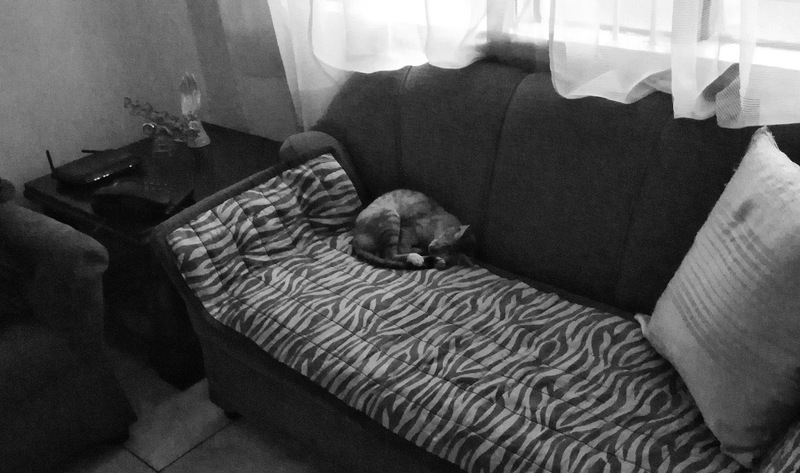 While it broke my heart to see you like our pet cat, curled up and soundly sleeping, I still knew it would do you good. You see, I told you that if you don't wake up by yourself, you wouldn't go to school today. I was up almost all night going in and out of the room checking on you. Come 4 in the morning, I texted your bus driver not to pick you up. Then I heard a soft knock at the door. It was you – clad in your towel, all wet and shivering, freshly bathed. To be honest, that was like a pat in my back, a star stamp for doing an awesome job in disciplining you. Your father and I were right all this time – tough love works best for you. You are a thoughtful friend, sweet granddaughter and caring big sister. But as a daughter, I must admit, you are slowly giving your old folks a hard time understanding you. Going 10 isn't easy, I know. Please be reminded, though that I have been there and braved it well despite being poor and fatherless. Okay, I'm sure you are wondering why I'm expecting so much from you. Well, the moment I laid my eyes on you at the hospital recovery room, I knew that you will be the stronger, better version of me. It's in the combination of your genes, methinks. Isn't it that I told you that I almost lost you when you were still in my tummy? Babe, you didn't just quit! You held on so tight to a full stretch of 40 weeks and now here we are discussing why you slept at the couch last night. The morning was quiet as you swiftly and gracefully dressed up. You combed your long, black hair with ease. It was an unusual sight. I got used to seeing you struggle with its tangles, ending up with me having to speak a litany of hair care reminders ehile helping you. And that, my dear, pisses you. Ha, whose fault was it anyway? But hey, you did great this morning. When I held your hand as I advised you to think about the things I've told you last night and why you needed to sleep in the couch, you suddenly have this aura of maturity. And as you walked out the door to bring out your purple school bag that you love the most, you looked like the sweet grown-up girl that we have always told you to be (because you're now a big sister). It's foolish of me to think that I was being too tough on you when I made you camp out on the couch last night. 'Cause right now, I think it was worth it. Ms. D sometimes we thought we are being so tough with our kids but in their eyes we are still that loving mom and without explanation, they still love us and wanted to be with us even we give time-outs, punishments and disciplinary actions. Haii. Nakakamiss magkaron ng nanay. I remember the time my mom learned I have a boyfriend, I was in 4th year high school then, she confiscated my phone and locked the front door I had to sleep in the balcony the whole night. JS prom pa namin the next day nun. Akala ko di na ko makakaattend kasi umalis na sya papuntang school but she came back and dragged me to the make up artist. I came in late and was nominated as head turner. Haha. Growing up fatherless was hard but I realized it was way harder for my mom- she had to be hard and soft at me at the same time. Tough love for me was really worth it. I wouldn't be who I am today if she loved me the other way. Naiyak naman ako :( tough love works on my kids too. My eldest is grade 1 and youngest is in kinder. There was a time na sinabihan ko sila na they should be responsible sa mga homeworks nila sa school and that hindi gabi2x nalang ako nagreremind, kaya ayun basta 8pm na, assignment na talaga.